Facebook is now a part of our life. There are million of peoples who addicted with it, and they can't live without opening Facebook. Facebook has number of disadvantages and advantages that we all know so, let's look into just advantages of Facebook and get benefit from it. You can be benefited by Facebook if you are a blogger. Just create a fan page of your blog on Facebook and increase likes. and then share the stuff you write on your blog with your fans. 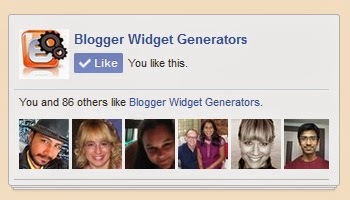 One of the fastest way of increasing your Facebook likes is that you have to put a like box widget to your blog. Facebook like box widget will help you to convert your blog visitors into your fans at same time it will be useful to make your one time reader to returning readers of your blog. Generally, you can find Facebook like box widget from Facebook that officially provides codding for it. but it looks very simple that most of the blogger are not satisfied with it and uses modified with CSS facebook like box to their blogs. You may noticed 3D style facebook like box on Labnol.org ? it looks beautiful and stylish, i just love it, and also i am using the same Facebook like box on this blog that you can see at the top on sidebar of this blog.